To persons unawares, it looks as though the South African state is throwing its weight behind Israel weeks after the UNSC’s damning resolution. It is well known that the racist ANC government in SA that has crippled the SA economy and its people , is hiding behind the Brics partners. The President and SA government has corrupted the government system and only enriched itself.After 22 yrs.in government. Billions of Rands are not accounted for. They are after all these years very green behind the ears , and the ANC knows that the day of judgement is very near for them to be in jail. Viva DA Viva DA ! Viva South Africa ! This is a very biased and anti-DA article. In my opinion, it’s become abundantly clear that the DA has– broadly speaking, always aligned itself with the US and Israel– thus it naturally has the support of most of SA’s Jewish community. This, despite the fact that Israel’s policy towards Palestine cannot but be completely condemned, not only by all South Africans, but by all fair minded and clear thinking nation states around the world, as well as the greater global community. Since this piece was posted, Trump’s policy towards Israel, remains pathetically weak, as he too succumbed to pro-Israel, mostly powerful Jewish Americans in the US senate and congress and disapproval of Israel’s discrimination and actual war against Palestinians, not only continues, but land grabs and suppression of Palestinians are escalating– which actions are nothing but despicable to anyone respecting human rights and the rights the Palestinians have to their land and country, which has virtually in total been stolen away from them by Israel, since 1948. Thus, the DA practices what is politically expedient for its future as a party– reflecting the same double standards so evident by both the US and Israel toward not only Palestine but Syria and Iraq as well. As for the ANC– While over the last 20 odd years, while this party had everything at its disposal to unite SA as a nation, it did not– choosing rather the opposite route and furthering racial divide in South Africa. If at minimum, it had honoured its promises to the poorest of our land, it would at least have distinguished itself, but it failed dismally to do so. Instead, the ANC not only became self serving and secretive and corrupted. Had it instead, but gathered and employed the skilled human resources it had at its disposal from white sector South Africa, to uplift and bridge the divide between black and white, to progressively eradicate inequality, SA would not be in the mess it finds itself today. But they did not heed Nelson Mandela, who knew that the wise course to defeat the globalists, was to unite South Africans of all races and rebuild her together. If it but stopped at this tragical neglect– still it went on and without spelling it out here, the ANC lost its founding principles, instead of attaining political maturity and the respect of all South Africans, it betrayed not only its poorest electorate, but South Africa as a whole. As of now, is it not rightful to ask, “Whereto South Africa?” For neither the ANC nor the DA have shown their commitment to South Africa– Neither of these parties, have served the people– only their own selfish personal and political ambitions– and not South Africa and the future which every single South African deserves. 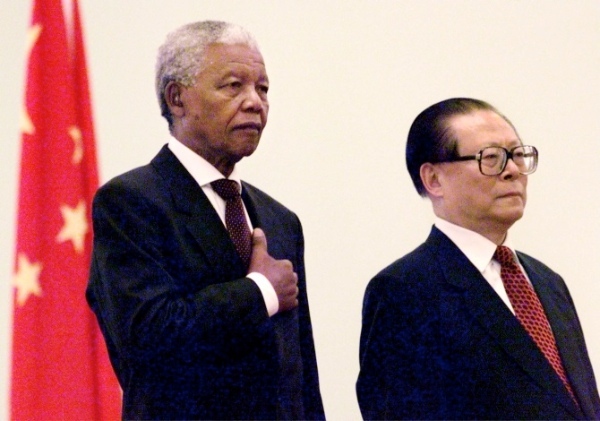 IMO, the ANC compromised its membership of BRICS– placing SA between the Devil and the deep blue sea– if one only considers the massive debt SA today owes to the IMF and or the World Bank– funds which it would seem ended up supporting in the main, what has become a welfare dependant state of still mostly unskilled and jobless people. So neither of these two parties deserve to lead South Africa– one of the most wonderful countries on the planet– to boot richly endowed and as a united people, sorting out its own problems, and with all eyes on one goal– becoming one of the strongest economies globally– able to independently steer its own future in a fast changing world.